I had an AMAZING long run yesterday. 12.6 miles of pure Bliss. I could have run all day, but forced myself to stop since I had 2 hours of Volleyball to play that night. Which FYI my team ROCKED and we beat the #1 team and we are now tied for #1!! More about running later... I know you ALL want to get the the Giveaway. **CONGRATS!! Please email me your address and I will send you WARMTH..
To introduce you to the Brooks for Her Collection the wonderful people at Brooks are hosting this amazing Giveaway. THANK YOU BROOKS!!! Function: Pink-and-white technical zip-up with brushed interior and retro track-jacket style will likely become your favorite performance "sweatshirt." Even better, your purchase of this item helps support those affected by breast cancer. 1. (Required Please) Visit the Brooks for Her Collection website HERE tell me, and Brooks, which products you are interested in and/or what you would like to see in the future. Leave a comment. 2. (Required) Contest open to Tall Mom Bloggy Pack Members only.. If you are a Follower, you are in luck, if not click to Follow. If you do not have a Blog please email me and I will comment on your behalf. I realize there are many readers who do not have Blogs and I do not want to leave you out. (tallmomontherun at hotmail dot com)..
3. You can earn 10 entries if you purchase an item in the the Brooks For Her Collection. If you buy more than one item, you get 10 points for each. This is on your honor, please let me know what you bought in a comment and I will credit the POINTS. 4. If you have run/walked/sponsored/donated/volunteered at a Race for the Cure event, or any event supporting Breast Cancer Awareness, please let me know which event Name, Date, State, etc. You will receive 3 points for each event. 6. Tell me about how you plan to Go Pink in the year to come. Leave a comment 1 point. CONTEST ENDS ON Sunday November 1st at 3:33PM. Winner will be announced on Monday November 2nd. Many will enter one will WIN.. Happy Commenting.. I'm loving the BFR stuff, especially that gorgeous jacket and epiphany shorts. I love to wear pink!! I only wish there were more items in the BFR collection. I would love Brooks to make a night life item in Brooks for Her. Think about it; reflective pink!!! That's what I'm talking about. I went to Brooks and love the Brooks for Her Skort and Tank! Such a cute combination and I am still searching for a really great running skirt.....maybe this is it!!! Have been a follower for a long while!!!! Love your blog!!! I have done the Breast Cancer 3 Day ( 60 miles) 2 times!!! In 2004 and in 2006!!! What an amazing experience!!!! posting on my blog now!!!!! I am seriously considering doing the 3 Day again in 2010!! If not, I am going to make a real effort to volunteer at some of the local events and run in the local 5K and 10K walks this year!!! I had to laugh when I went to the Brooks For Her Website because I am wearing (this very moment) the Brooks for her running shorts with the ribbon that they have on the website and LOVE them. (Not sure if that counts as a purchase as I bought them last month...) I'd also be interested in running pants not just capris. I sponsored a walker (Anna) for the Florida 3 Day Walk that is about to take place this week in St. Pete (Oct. 30-Nov.1). Forgot to say how I was going to go pink: I'm going to resume my annual donations to the cause and am thinking about doing the 3 day in 2010. I went to the website, and I like the capri pants (I do wish they had a tie). I would also like to see more items! YAY! that jacket is beeeyoooteeful! and congrats on a great run AND v-ball! wow- that is a huge day! woo woo! LOVE the vapor dry line-- i like the 1/2 zip and the long tights. such a cool idea to have outwear that regulates your body temp! a must in winter when you need to wear warm clothes but don't want to overheat over the course of the run! I did the Race for the Cure STL in June 2008. I Slept in for the Cure (with donation, of course) in 2007 & 2009. I donate every year to friends or fam who fundraise for the 3-day or a related breast cancer awareness walk. the first year after my mom went into recovery (she had breast cancer and has been in remission now for 10 years!) we walked all together in an annual awareness walk the hospital hosts. (the walk we did was Dartmouth HitchCock Clinic Keene, NH year... not sure! sometime when I was in high school). the most recent breast cancer 3-day I gave money to was this past August in Boston, my co-worker Amanda walked it with her friend. ENTRY #4- GOING PINK-- i will choose to purchase items that help cure breast cancer-- things with the logo and are marked as proceeds going toward the cure. I like the pink jacket and the black skort with pink stripes the best. I need capris and the capris look good too. I'm seriously checking out some thermal pants....I really need to add to the winter running collection. I'll let you know if/when I make a purchase. I did the Komen Race for the Cure 5k this year in Aug (I believe it was the 9th). I also did the Jared Coones Memorial Pumpkin Run on Oct 10 and a portion of the proceeds go to breast cancer (Jared Coones passed away from Leukemia and his mother Jayne passed from breast cancer, so the proceeds go to both organizations). I'll link up in my next post. I like the Epiphany Straight Short and the Brooks for Her Hat. Very cute stuff! Love the Jacket. Wish there were a few more items in the collection. I love the Vapor Dry 1/2 zip and Epiphany jacket! I am a follower. I checkout out the website, and I think those shorts look to be about the comfiest running shorts ever made. I'm usually a skirt girl, but these might win me over! The jacket and capris look amazing to run in during cooler temps! LOVE LOVE LOVE the skort! Great giveaway! definately love the brooks running skirt! i think it would be super comfortable and easy to workout in! Yeah I am so excited!! I am going to use these in my Philly race (last year it was 14 degrees!!)! I have been yucky and sick and this made my day!!!! Alright girl, you've been on my google reader, but I'm an official follower because I WANT THAT JACKET! Like, for real. I've never owned running capris, but I'm kind of digging the Brooks ones on the site with the little pink ribbon. It's cute and goes to a good cause. Nice work Brooks people. And in the next year I plan to go pink by buying Breast Cancer Awareness products whenever I can in the stores; it is for such a good cause. I might even make the Race for the Cure my first 5K next year...I really should! Thanks for doing these wonderful giveaways! I'm loving the capris, but only b/c I already have a skort that I love. I have the skort for when it's hot, tights for when it's cold, so I need a good inbetween! First off, I love everything pink! I really like the Brooks for Her Tank Top, T, and Jacket! I would love to see Brooks have some clothing for those running in the Disney Half Marathon. I love the epiphany shorts! I have done the Avon walk for Breast Cancer twice in Washington DC in 2003 and 2004. I plan to GO PINK by buying products that support breast cancer research whenever they are offered. Oh, I also forgot to mention that I did the National Race for the Cure 5K IN Washington DC in 2006. I would love to own the Brooks for her SKORT... how cute is that??? I love the hat as well. I am blogging about my next poison either tonight or in the morning.. I will def be linking you and Brooks for her... love it. I LOVE skorts! So I love the skort but wish it came in XL. Lady Clydesdale like to run in cute skorts too! I have NOT run any Breast cancer races.. sadness... But I really really want to. This is how I plan to go pink in the future. I hope to run at least 2 breast cancer awarness races in 2010... Not many in my area. But I will get it done. just blogged and linked you... #1 down. I love the running capris, jacket and hat! So adorable, and for such an amazing cause. More reflective gear would be awesome from Brooks. I also sponsored Danica from Chicrunner.com for her Avon Breast Cancer 2-Day walk on September 12-13th by donating to the cause. I love all the products. The capri and the skort look great...so does the tank top. I love the items they have. My favorite is the skort. I would like it better with briefs as opposed to compression shorts. I'm a follower and have been for a little while now. Love your blog. I donated this year to help a friend raise money for a 3-day walk (like I did in 2006, 2007, and 2008...although different friends each year). Of course, I am a bloggy pack member...and I just posted a link to the giveaway. What a great product line! I especially like the jacket and capri pants. So cute...and I LOVE pink!! I did the Komen 5K Race for a Cure in May of 2003 in Columbus OH. That was a loooong time ago! Here's the link from my blog! I worked as an oncology dietitian for 4 years, so breast cancer (and cancer support in general) is a cause near and dear to my heart! I love Brooks!! My running sneakers are by them, and I can't say enough good things. ~After looking through the stuff on the site, the jacket is definitely my favorite item. ~ I can't click follow because my blog is on wordpress, but I added you to my blogroll. ~ My first 5k was the Susan G Komen Mother's Day run this past May. ~I plan on continuing the tradition of running in the Mother's Day 5k, and I hope to walk the 3 day within the next few years. Okay...I LOVE the jacket, but the skort is cute, too! I wish I could afford something right now...but alas, I cannot. I sponsored by good friend Melanie in her Race for the Cure ;) in 2008 & will be sponsoring her in her Marathon for the Cure coming up. ;) We also sponsored family friend Michelle in the most recent Seattle 3 day walk. 1.I like the Brooks for her hat, looks like it would be good to wear during summertime runs, since I run in an old baseball cap. It would be cool to see running socks. 3. I walked with my family in the Komen Walk for Cancer on October 4th,in Syracuse, NY. We walked for my mother in law who is in the middle of her breast cancer treatment, and her sister, who is now breast cancer free. 4. I've been blogging about my mother in law since her diagnosis, so I'll be going pink on many levels over the next year. 5. I'll share your giveaway on my next blog post, then comment again with the link. Also would like to see reflective pieces on the clothing. I love the jacket, but I also like the capris and running skirt. I think they need to create a tank top that doesn't go up to the neck. I like to run in tank tops that give me more room to breath. What a great giveaway! I'm already a follower. First off, great job on the blissful run. I love those! So I would totally want the jacket or the shorts! i'm loving the hat, i think i might need to think about investing in a hat for running (to keep the sweat out of my eyes). i'm also liking the capris, i'm short so i usually only buy capris because pants are usually too long! AND i'll go pink in the year to come (any many years to come) by continuing to participate in the susan g komen race for the cure events & support breast cancer research by wearing my pink ribbon & wrist band! First entry: I'm lovin the capris, and the HAT because I'm definitely a hat girl through n through. I'd love to see a headband and gloves for my chilly Minnesota weather! entry TWOO!!! I just clicked to follow! I am not a Blogger.com blogger, so I hadn't used the following tool thing, but I realized I can sign in with my wordpress account! and entry THREE! I ran in this past Susan G Komen race for the cure 5K at the Mall of America (Bloomington, MN). It's the second time I've done it, and it is so amazing to see all that pink and all that dedication to finding a cure for breast cancer. and I have an entry #4! My plan for going pink this year is to get better at doing self breast exams. They teach you once when you're like 14, and then you forget about it. I want to ask at my next yearly exam to make sure I am doing them correctly, and set a reminder in my iCal to do them throughout the year! could this be anymore up my alley! Is that how you spell alley? Anyway, I'm thinking I'd have to get the skort to go with the cutie patutie coat!! You know how I love a good skirt, especially one that has pink! And you know I'm a follower. P.S. THANK YOU FOR THE PACKAGE!! I got it Fri. night just in time for my long run on Sat. Totally tried out the new products, too fun. It's about the most excitement I've had since the marathon!! Hope you raise the awareness for all things Brooks. A great cause all around. #1- I've been a follower for a while. #2- I visited the BFH site and I LOVE the skort! I really like that it has a zipper pocket in the back and a phone pocket in the lining. I'm a sock freak so I'd love to see some cute, comfy, pink running socks. #3- I posted a link to yours on my blog, with the picture of the jacket and the BFH logo box. I also included the description of the cause. #4- I plan to be pink this year by getting my first mammogram. I really love the BFH pink shorts! I am also a big fan of the capri spandex because they work for warm and cool weather! and I will be posting about the giveaway when i get a chance to post today! Included a link in today's post. 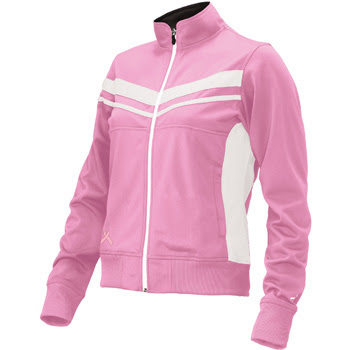 I visited the brooks site and I love all of their things..I really love the jacket and the capri's-love the pink touch! I plan on going pink this next year by running in the race for the cure. I also am signed up to run again with my awesome ragnar team Running Angles-which we run in honor of a great lady who died of Breast Cancer. I have helped in 3 Race for the Cure Events the past 3 Years. I do this in remembrance of my Grandmother Betty Malone. My mother and I try and do at least one event or participate in a cause for the cure once a year. I am in love with the Brooks Pink Tank-I have not purchased it yet. Thank you so much for raising awareness for this! Just added another link to today's post!!! Ok, I want the pink shorts. Yes PINK is my favorite color. I also became a follower of your blog just today. I'm posting info on my blog just as soon as I'm done here. Forgot to say that I will go PINK this year by getting my first mammogram. Yay! I'm a follower so I am IN! I love the looks of the epiphany shorts. I looooove Brooks, btw. I ran in the Albany, NY Race for the Cure on Oct. 3rd. And I ran the Race for the Cure this past June here in Raleigh, NC. Next year? I will run the Race for the Cure again (for the 4th year in a row) and help increase awareness in breast exams - I had my first mammogram this year at age 33. That jacket is amazing! I would love to win it but if I don't I might have to invest in it and the Brooks for her shorts--I wish they had more items! i love the tank too....oh, oh too many options! I ran in the Race for the Cure North Mississippi last weekend (thanks for the High Five!) in Tupelo, MS on October 24, 2009. I mentioned your giveaway & the Brooks for Her Collection on my blog. Holy moly, so many comments already! Well I want to play too! I LOVE my Brooks epiphany shorts, so I would certainly love a pair in PINK! My friend Debbie Evans has done the 3 day in AZ for the last couple of years, and I ALWAYS donate to her!! I am a follower! Total Tall Mom Stalker!!!! Not sure if this one counts but my friend AN the RB is the swim coach at the Y here in Tacoma and she had a swim meet Saturday and decorated the pool area with PINK BALLOONS!!! It was awesome! I was there to cheer and support her! I LOve the pink jacket and since I am a capri girl, I'd like those as well. You lead - I follow. I linked your giveaway with mine..which was inspired by you from your giveaway. The portland fam run looked beautiful!! I forgot how pretty it is too see the leaves change. Great job on the run! I love the capris and the jacket is too cute! That jacket is super cute, but the epiphany shorts also jumped out at me when I looked at the collection. I love that Brooks is doing this. Running for breast cancer benefits is close to my heart. I have run in the 2007, 2008, & 2009 Race for the Cure events here in Las Vegas and the 2009 Global Race for the Cure in Washington, D.C. I was even in a video about the Race for the Cure (It's from New Balance, a Brooks competitor, shhh... youtube.com/runningonhope) and I'm running the RnR Las Vegas half this December to benefit the Komen Foundation. I love companies that give back and do something good! As for ging "pinker" im running my first ever mini marathon this december!! woo!! I just added your blog to my reader - guess that makes me a follower! I am really interested in the Brooks Capri, as I already own a pair and love them. 1. I love the jacket, of course, but I'd like to buy the capris. I don't have any and they look comfortable for runing in the fall. 2. I love your blog & read it everyday. 4. I started running for the lst time last year & ran the Susan G. Komen Race for the Cure in Oct 2008 and I ran it again this past October. 6. I plan to run in the race for the Cure again. I buy most anything that donates money to this cause - I have 6 close friends who ware breast cancer survivors. 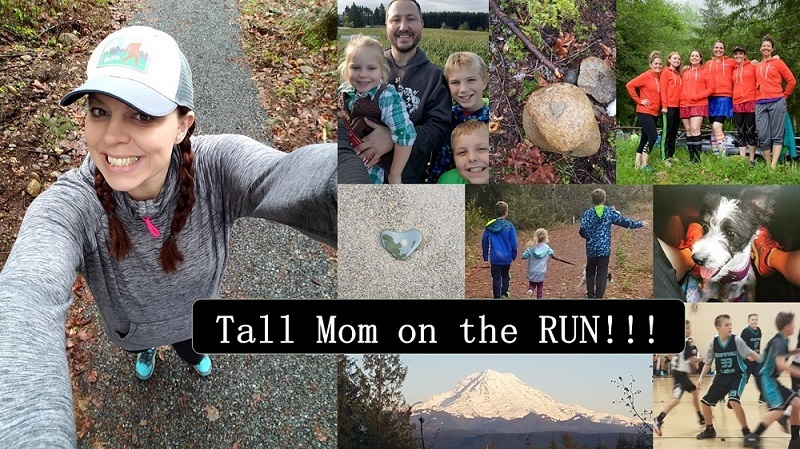 I am also a Mom on the Run!!! So glad I stumbled across your blog. I love the flare tights. They would be amazing to work out in. Better late than never. I love, love, love the pink shorts!! I might have to buy them. I also like the T. There is nothing better than a white running T! And the pink ribbon is the perfect touch. And I put a link to the giveaway on my blog and will mention it in my next post with a picture. Hi Mel - I'm new to blogland and I just started following your blog. There are a lot of great items in the Brooks for Her collection. I love the skirt and the pink sleeveless top, but I'd also like to see a long-sleeve top. Something like the short-sleeve top would be really cute! I ran the National Race for the Cure in June 2005 and did the Danskin Women's Triathlon (with my aunt, a survivor) in July 2005. Even though breast cancer has affected people close to me, I'm ashamed to say that I'm not diligent enough about my own exams. In the next year, one of the ways I'm going to Go Pink is by paying more attention to my own breast health. Thanks for the great blog and the great giveaway! I love the Brooks for her running hat! With my fine, fly-away hair and me sweating like an over-grown man, a hat has been my saving grace. Would be nice to have one that is non-cotton! Plans for the year to come .. I really want to run the Race for the Cure. I planned to this year, but we ended up being out of town that weekend. Also, I have always wanted to get a team together to do the 2-day Avon Breast Cancer Walk. Maybe in 2010? A shout out on my newest post!!!! Yay!! I'm gonna win! I just know it!!! Haha!!! Another shout out on today's post AGAIN!! Hope I am getting points on all these cuz I REALLY want to win!!!!! First I have to say I've never had a Brooks apparel item I haven't loved. They packe their stuff with features runners need and love. I especially like that BFH pink tank and the skort...and the capris too! 1st entry- clearly I love everything pink and therefore am obsessed with that jacket. I also love the capri pants! Entry 2- I am obviously a follower! I love the jacket and I also like the epiphany shorts. But I think I'd get the shorts in grey with pink accents. It wasn't a Race for the Cure event, but I participated in the Danskin Women's Triathlon in Pleasant Prairie, WI on July 13, 2008. The proceeds from it went to the Breast Cancer Research Foundation. The event got a different name this year, the Trek Women's Triathlon and it was held July 12, 2009 in Pleasant Prairie, WI. Again, a portion of the proceeds went to the Breast Cancer Research Foundation. Breast cancer has touched my life. It's a disease that left me growing up without a grandmother. After being diagnosed, my grandmother passed away from it when I was just 4 years old. Everyone has their cause and for me, cancer is mine. How will I go pink? I'll tackle the Trek Women's Triathlon again in July and hope to get in on Trek's Breast Cancer Awareness Ride, a bike event that I missed out on this year because of a scheduling conflict. And of course I'll continue to give my support to the events and organizations that aim to raise awareness about breast cancer. -I love em all Brooks stuff! Checkin out their Thermals since it is freezing out here in UT. Love their Long Sleeve Tops. Would love to see a pink reflective one, half zip kind. -I will plan on running the Run for the Cure Race in St George next year & volunteer whenever I can for the cause. I like the white and pink short sleeve shirt. I like Brooks gear, and my husband has their running shoes. I like the pink epiphany shorts but that jacket is really cool!! I tried postin the pictures to this link....but it wouldn't work, so I blogged about it and posted a link! Did I miss the cut off? Don't think so, but I'll try either way. 1. I pretty much love everything Brooks, I really want a pai of cascadias, but I love the run ez tee too :). Oh and of course I'm a follower.